On Wed., May 10th we have the Incoming 5th Grade Parent Night here at Kennedy. This year we are trying out something new and inviting the 4th graders to come as well to participate in some fun team building activities. We are looking for Peer Leaders to volunteer this night to help greet parents and run these activities with the 4th graders. We have a very exciting volunteer opportunity to present to you! We have been asked by Crossroads (a school for children on the Autism spectrum) for volunteers to partner with 13 of their students at the Special Olympics at Natick High School on June 7th (rain date of June 9th). We are looking for 13 students to help during the training sessions on the dates listed below and then to attend the Special Olympics. A bus will be provided to and from and an adviser will be there with you. I need to give the names of the Peer Leaders to the organizer (Mrs. Chakiris- school pyschologist at KMS) by the end of the week. Parents will be contacted to get permission and teachers will need to be notified of the class time you will be missing. You will be responsible for all classwork missed during the training sessions and during the Special Olympics. The training sessions will take place during Period 7 on May 5, May 19, May 26 and June 2nd. Training sessions will take place on the back field at Kennedy. Please email Mrs. Dwyer back ASAP if you are interested and I will pass along your name to Mrs. Chakiris. This should be a very exciting opportunity for you and for the students you will partner with! Please seriously consider participating. As you know, today was the start of Kindness Week 2017 which will run through Friday. As not all of you were at our last leadership meeting, here is a breakdown of what will be taking place this week. Some of you are already involved in helping out with something, but if you aren't and if you are able to help with any one of these events, please see the advisor running the event. *As you heard this morning, we will also be reading daily announcements with a kindness quote as well as sharing with the rest of the school what is going on that day. If you'd like to read a morning announcement some time this week, please see or email Mrs. Morin. See any of us with questions! ​Permission slips are necessary for the bus to NHS on Thursday for the Youth Leadership Summit- a blank permission slip is attached. Please turn in the permission slips to the folder on Mrs. Lederman's desk. All Leadership and Interact members have the opportunity to buy Pulseras BEFORE the sale starts on Monday. You may only buy ONE each (next week you can buy as many as you want) and they are $5. If interested, please go to Mrs Hacket's room immediately AFTER SCHOOL on THURSDAY with $5. 4. Tour de Natick- Father's Day- more information to follow but we are looking for volunteers! ﻿Natick Public Schools district app has been launched! Download now! 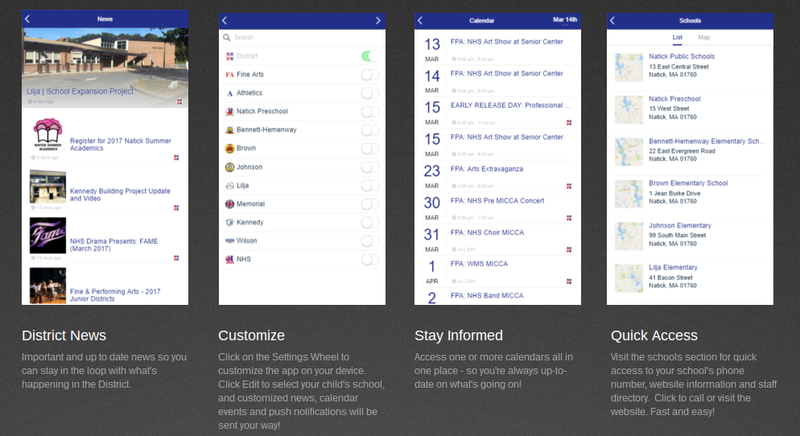 We’re excited to announce the release of the new Natick school district mobile app! As the first mobile app for the Natick Public Schools website, this will work to provide the same great information from our website with added convenience at your fingertips. DOWNLOAD the app to a mobile device or tablet. When launching the app for the first time, select ‘YES’ to receive push notifications to receive news and updates that get pushed to devices. The app is available in the iTunes App Store and Google Play Store. Below is the link to register for the Youth Leadership Summit that is taking place at Natick High School on April 6th from 3-5pm. Cougar Pride Leadership Team students are HIGHLY encouraged to attend. Thank you to those who have turned in your permission slips already. Please turn your permission slip in ASAP- we need to know how many students will be riding the bus to NHS. There are extra permission slips on Mrs. Lederman's desk in the office if you need one! Please register, with an adults help, yourself for the Summit. The link also has information about the Summit itself as well as the speaker. This event is being put on by Spark Kindness. Please let an adviser know if you have questions. ​The Cougar Pride Leadership team has been invited to attend the Youth Leadership Summit with presenter Rosalind Wiseman. The event will take place after school from 3-5pm on Thursday, April 6th at Natick High School. This event/speaker is sponsored by SPARK Kindness and students are HIGHLY ENCOURAGED to attend. KMS will be providing a one way bus for students to Natick High School. Students will need to find their own ride home. Permission slips were passed out at the Leadership Meeting on Monday. If you did not get a permission slip for whatever reason, please see Mrs. Lederman's desk in the office. Return your permission slips ASAP so that we can get a head count for the bus. See any of the advisers with questions! This one-day conference brings together over 1,400 middle school and high school students, teachers and community leaders from over 65 schools across New England. This inspiring day will provide middle and high school students—and their teachers—with the opportunity to explore what it is like for people of different national origins, ethnicities, races and religions, to live in the United States, and to develop action steps to foster schools and communities where everyone is welcome, respected and valued. There will be keynote speaker and breakout workshop sessions. The theme of the conference is "There is No 'Them', Only Us." Students going to this event received a field trip form on 3/2 after showing interest in attending, as we can only bring 20 students. Some students from Kennedy will be presenting! Join us for Hoopla on Thursday! Be sure to join us on Thursday, February 16 for the annual KMS HOOPLA - Grade 8 Boys & Girls Basketball Team vs. Kennedy Faculty! The game starts at 3:30pm. Make a poster to support your favorite teacher or KMS basketball player. There will be a half-time contest and concession stand. Tickets will be on sale this week at lunch and at the door. We hope to see you there for this fantastic event! Note: Students cannot wait around the building until 3:30pm. You must go home and then return for the start of Hoopla.